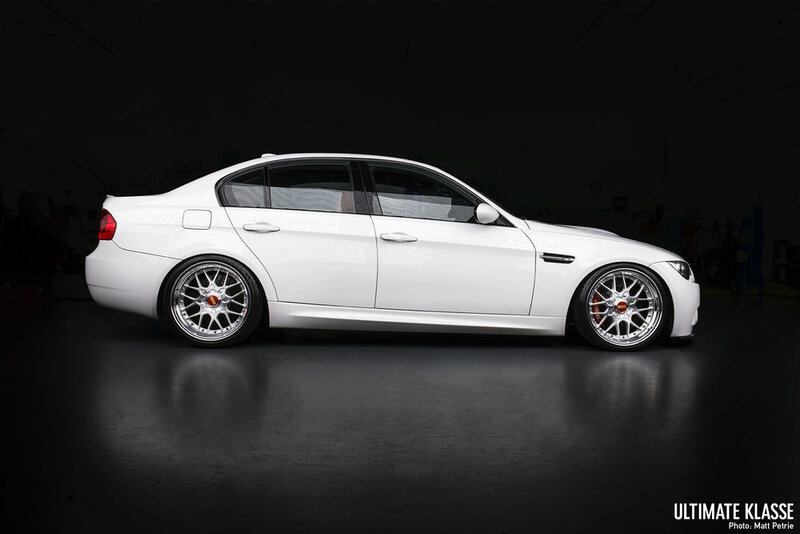 It is hard to believe that the E90 M3 is rounding out the tenth year since it’s production. Yes, ten years have gone by already and it is being celebrated by ill fitting bolt-on wide body kits and flame shooting, burble tunes that bounce off the rev limiter. Sorry for the spoiler alert, but you won’t find that in here. No, instead Sam chose a cleaner approach. 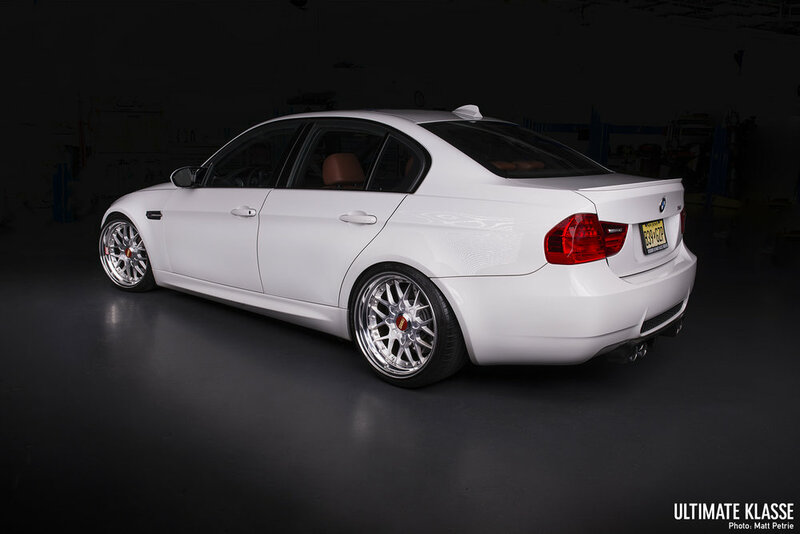 The phrase that comes to mind and best describes his E90 is “elements of traditional ways”. Each of these individual components are not contemporary by any means, but he carefully chose each aspect and perfected them uniquely, reintroducing excitement for the chassis a decade later. When it comes to suspension, there are so many ways to lower the car. Despite all of the possibilities, there was only one option for Sam. 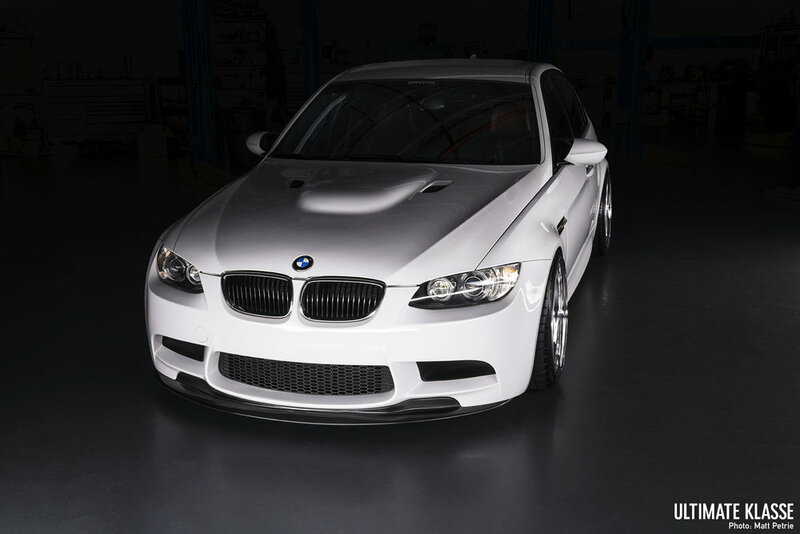 The Ohlins Road and Track coil overs were selected to ensure that his ride remains smooth and capable to tackle the tri-state roads while sitting tightly over the wheels. 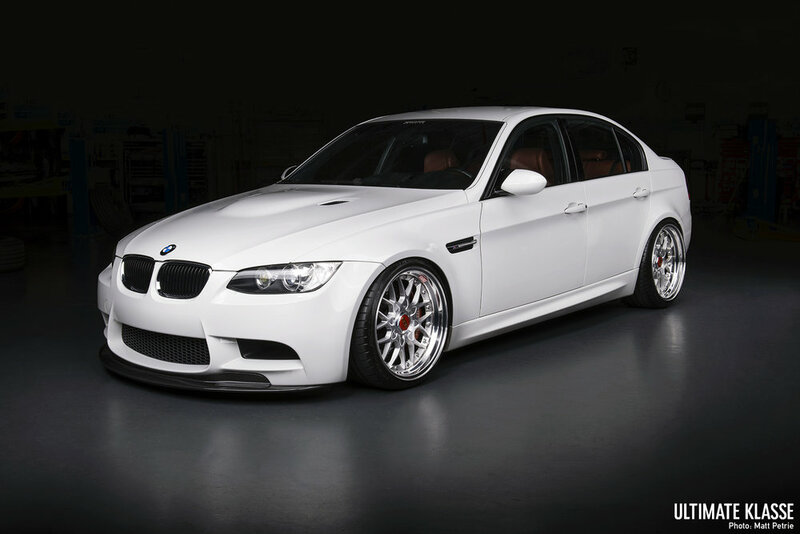 It is no secret that BBS is synonymous with BMW. Although you need to count on your toes for E9x’s with BBS wheels, Sam still manages to keep the bar elevated. The wheels are not the standard, concave face that is more commonly seen. His are the rarer, flat face RSII’s, which gives the wheel more of a traditional RS appearance. It allows the wheels to be built wider while clearing enough room for big brakes. On the other hand, something that is rarely seen on this platform, are the velocity stacks. Even though trumpets have been married to independent throttle bodies since their conception, his 8000+ revving V8 is packing a little more than just the orchestra horn section. His design and execution with factory functions are what etch its rank in velocity stack comparison conversation, but we’ll get to that in more detail later. The use of color is so crucial in any build and a three-color pallet requires a specific eye, but more importantly, the right taste. Although white is a neutral pallet to work with, it is Sam’s use of the red and brushed silver that solidifies the execution. Throughout the car, the coordination is so seamlessly integrated, that one can miss the cues or just simply take them for granted. Against the Alpine White slick top, the contrasting interior is merely a glimpse away. 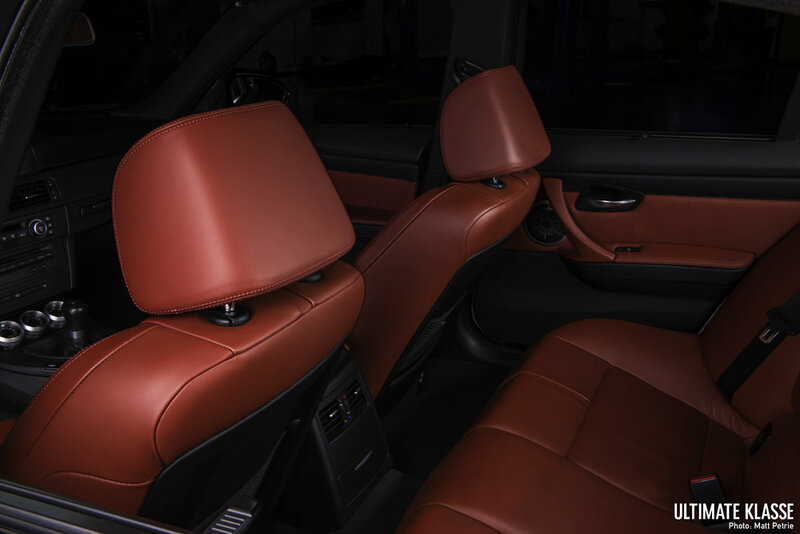 This car was originally equipped with black leather, but it was since fully replaced with the more desirable Fox Red leather. To take it a step further, he completed the conversion with the fold down rear seats, which were previously affixed in the back of the cabin. Along with the color swap, he updated the navigation system to the LCI spec, which changes the screen and menu format as well as the better idrive control unit in the center console. Also occupying the center console are the F10 M5 shift knob and an AEM gauge cluster to monitor vitals. Even their silver bezels were kept in mind to tie in with the silver accented components around the interior. The red on the outside of the car is minimalistic, but extremely effective. 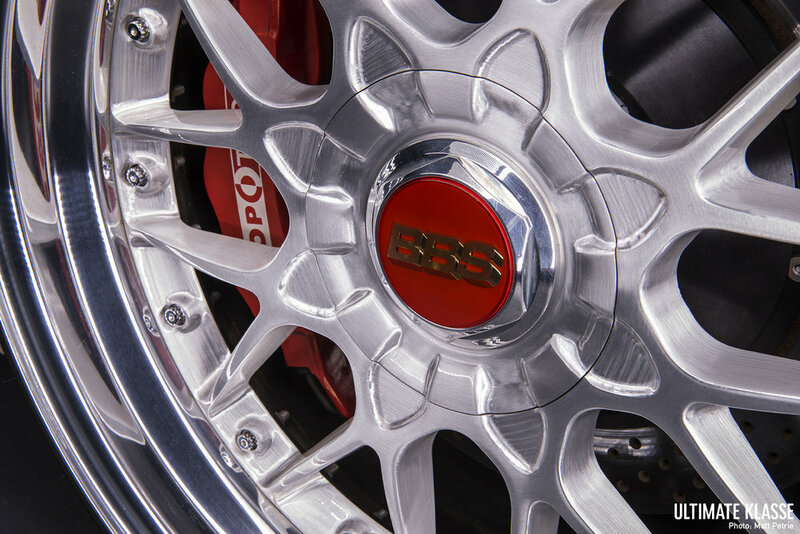 Red StopTech ST60 calipers hover millimeters below the brushed BBS faces. On those brushed faces, sit custom height hexes that house red BBS center caps. When the hood is opened, his valve covers, dressed in wrinkle red, provide a vibrant base for the trumpet display. Another item that is not normally red, nor in the S65 for that matter is the physical dipstick. Those of you unfamiliar with the S65 and wondering why a dipstick is being written about, is because these cars only have electronic ones that read on the instrument cluster and are hardly accurate at that. Sam’s S65 oil pan had been given the VAC treatment of baffled channels and a good ol’ fashion dipstick to pull out and wipe down. He made the swap during his upgraded rod bearing replacement. Of course, we can’t pop the hood and only talk about the red valve covers or a silly dipstick. Matching the brushed finish of his wheels are the 2M Autowerks machined velocity stacks for the S65’s independent throttle bodies. The sound of throttle bodies grabbing the open atmospheric air before you is glorious and intoxicating. All you want to be doing is driving the car two gears below where you should be, but simply running the machined trumpets was not Sam’s end goal. His thought process was thorough and very definitive. 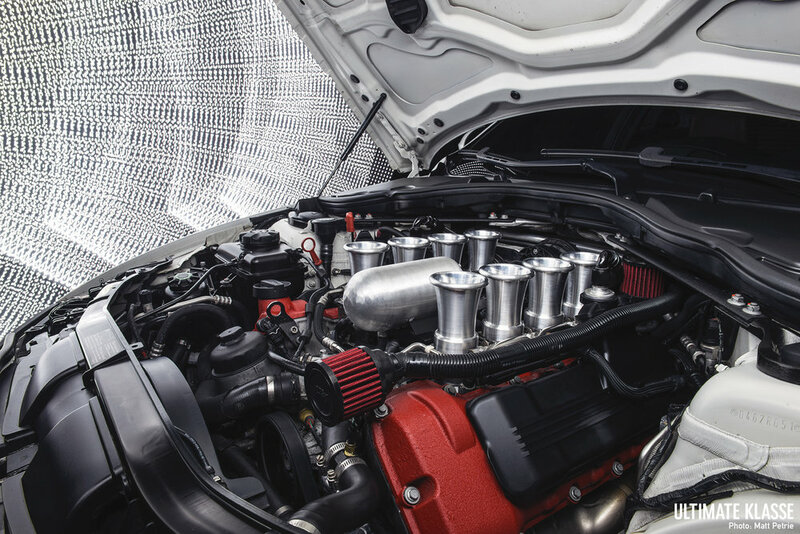 On a functional side, it had to mimic the factory plenum plumbing to keep the car happy and have no irreversible modifications to make it work. While brainstorming the layout, he did not want to incorporate any covers or trays around the trumpets. “I don’t want to loose the mechanical feel of this, I want the engine to look like an engine” he said adamantly. No disagreement here. Although succinctly stated, he’s completely right. Seeing the fuel rails and linkage along side the newly introduced oil air separator AN lines or the bullet shaped oil catch is a beautiful thing. He drew up some sketches for the cylindrical oil catch and then handed it over to his friend and local machinist, Eric of Tribal Iron Customs. Carrying out the brushed finish, the bullet shaped conversation piece also integrates the factory drain mount in the same location below the plenum. Focusing on the details, he even made a little bracket to hold the filter in place above the valve cover. Equally as impressive as it looks and sounds, is that attention to detail. He is not finished with this project either as there is still more to come. 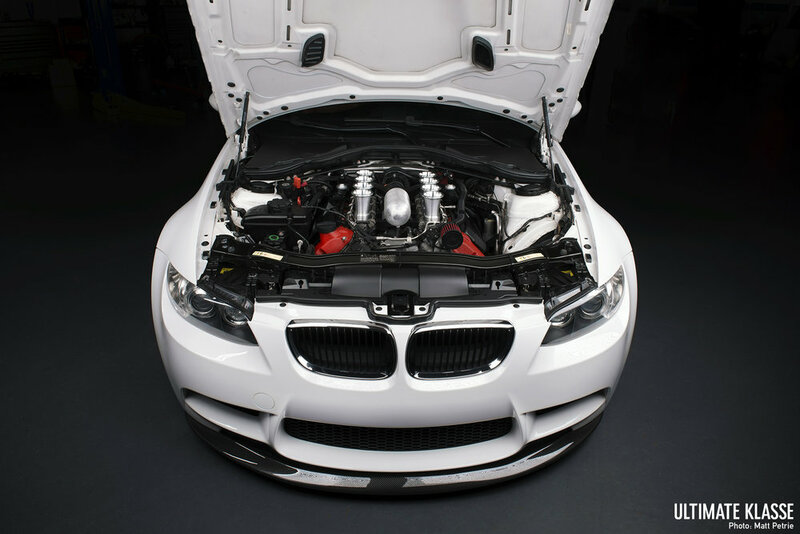 The plan is to utilize the factory air ducts from the bumper and kidney grills by having filtered channels 3D printed to his specifications in order to feed it with as much clean air as open ITB’s can get. Rather than removing the chrome accents around the car like the headlights and the grills, Sam kept them to compliment the polished lips of his wheels. A European inspired shaved front bumper and NLA original Challenge diffuser are just more examples of how little details go further than radical aero and body work. Sam did not rewrite ‘the book’, he just pulled a few chapters out, added some vibrant illustration, and put them back in to show the rest of the community how it’s done.